I love making goals. There’s something of a fresh start wrapped up in a goal. If it’s a good goal, we are working toward something that we want. When I was first outlining my video on this topic (link below), I asked my husband to randomly say what he thought about goals. He said, “Well, goals are really desires, aren’t they? When you achieve a goal, you get a sense of fulfillment.” Bingo! He totally hit the nail on the head! Let’s think about goals as desires and things that will bring us a sense of fulfillment. Using that frame of reference, write down a list of goals. One of the challenges of creating and achieving goals is our own ideas about what we “should” write down. We “should” lose weight. We “should” exercise more. But is that what you really desire? It might be. The trick is to figure out the Big Why of each goal. If there isn’t one, it’s time to toss the goal. Now it’s time to check in. Is this a reason that resonates with my heart or do I need to ask myself “Why?” again? Actually, that feeling of being energized and positive is very motivating for me. I remind myself of that feeling whenever I am tempted to eat too much or skip exercising. You keep asking yourself “Why” until you get down the reason that has meaning for you, the one that truly feels like a desire and that will lead to a sense of fulfillment. That reason is your Big Why. It’s the reason that you feel in your heart. If you keep asking “Why?” and never get to reason that feels like a desire, mark it off your list. It’s a “should” goal and you probably won’t achieve it anyway because it doesn’t have meaning for you. Now, you have a few goals with Big Whys. We want to figure out how to achieve them. I will use my goal of creating online classes as an example. I’ve wanted to create some online classes for more than a year. I want to offer the expensive leadership classes that I give to businesses to everyone at a reasonable price. I believe that anyone who is motivated should be able to pursue his or her professional development. It’s a big overwhelmingly huge and intimidating goal, which is why I didn’t begin on it for quite some time. I got started when I broke the goal down into Little Hows and realized that even small progress is better than no progress. If I stand in one place doing nothing for a year, I’m in the exact same place I was when I started – a year gone with nothing to show. I decided that the smallest movement forward was preferable. I knew that my website was awful, my website provider was frustrating, and neither could support the online classes that I wanted to create. The first Little How was “Find a web designer.” I broke that one into even smaller steps: 1) Search for WordPress web designers, 2) Look at their work online, 3) Outline what I want my website to do, 4) Set up interviews with web designers, and 5) Pick one! I use the same system to get started on our taxes each year. I will stare at “Do taxes” on my list and shudder. It is just too big a task until I break it down. I list the Little Hows: 1) Print off forms, 2) Collect W-2s, 3) Gather bank statements, 4) Find business receipts, etc. I get it done by focusing on the small steps, not the big picture. By even doing one small thing a day, I make respectable progress. Progress is what life is all about! We can move forward, make our desires a reality, and achieve that sense of fulfillment by thoughtfully choosing the goals and methodically taking small steps toward them. 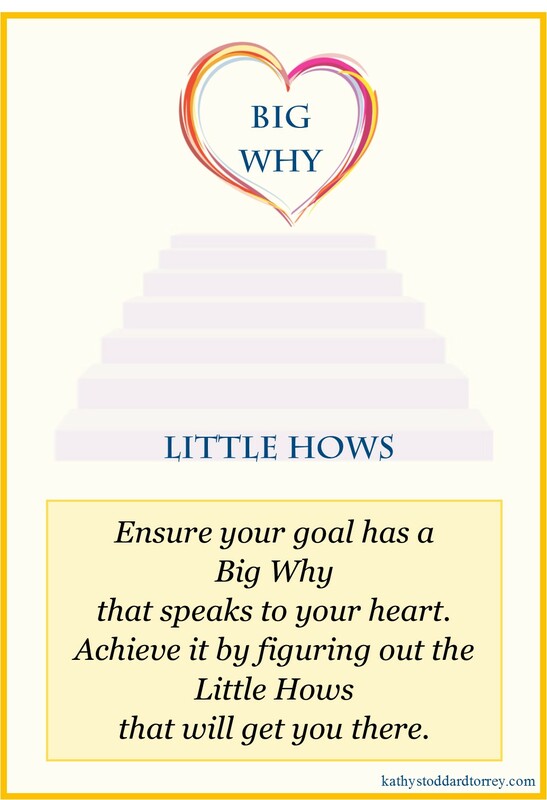 In other words, ensure your goals have a Big Why that resonates with your heart and then define the Little Hows that will baby-step toward your goal.